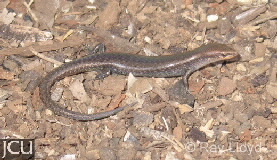 This skink may be found where ever there is litter in both dry and wet sclerophyll and moister woodland communities. The body is pale to dark brown with some darker streaks or flecks on the body. The head and the tail are often a reddish-brown or bronze in colour. Belly is whitish, the flanks and limbs are finely dotted with white. There are 4 fingers per forelimb and 5 toes on the hindlimb. Breeding males are flushed with orange on the flanks.